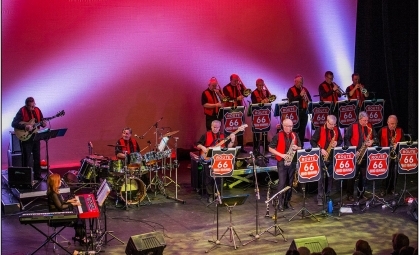 Route 66 Big Band are delighted to make a return visit to Mermaid Arts Centre. Their programme takes the audience on a musical trip from the big band era of the 40’s right up to date including numbers made famous by Count Basie, Glenn Miller, Frank Sinatra, Bobby Darin, Adele, Tina Turner, Tom Jones, Joe Dolan, Amy Winehouse and many more. There’s something to please everyone, from 8’s to 80’s, which has been the key to the success of this show and brings audiences back again and again.